This is a map of the Dukes Meadows and Riverside Lands area showing the many sports and recreational facilities, and where they are situated. of Recreation Area, the area shaded green on main map. 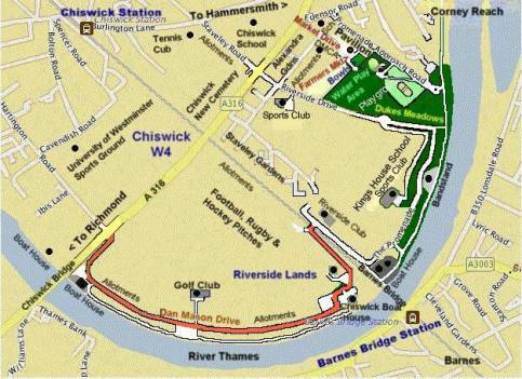 Dukes Meadows is situated on the banks of the River Thames in Chiswick London W4, the entrances are off the A316 the "Great Chertsey Road" at Chiswick Bridge via "Dan Mason Drive" and further down at "Riverside Drive".